Are You CPA Exam Ready? 0% Financing. Only $199 Today. Already Failed with Another Course? Best CPA Exam Review Course for Today's Student. Updated for the 2019 Exam. Do you know your ReadySCORE™? The industry’s best way for candidates to measure CPA Exam readiness. 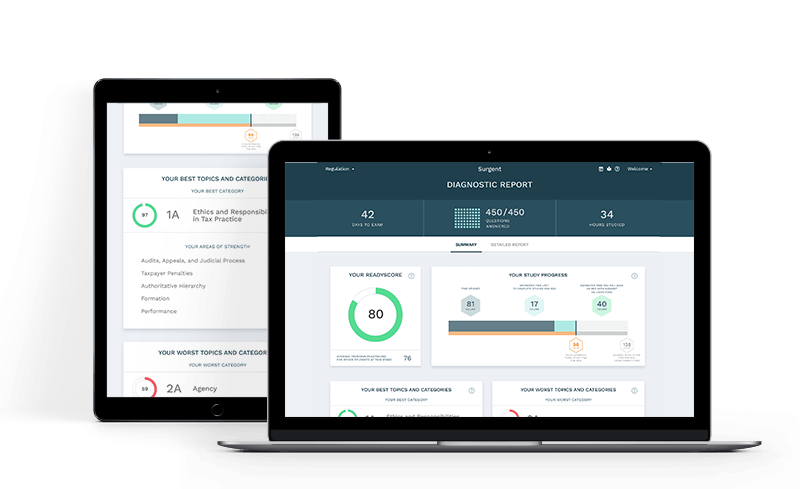 With ReadySCORE, you know how you’re performing cumulatively, as well as by content area and topic, and throughout all question types, like multiple-choice questions, task-based simulations, and written-communication questions. study what you need to learn & skip what you already know! Other adaptive CPA Exam Review courses have simplistic quizzes but no real personalization. study plans based on your unique and changing needs. Other CPA Exam review course videos are 2+ hours each. Who has time for that? Especially when you only need to learn one specific topic. That's why we keep ours focused and short (just 5-20 minutes). teach you how to solve the problems you will see on the exam. Download our white paper for tips & strategies for passing all four parts of the CPA Exam as quickly as possible. Please Note: by completing the fields above, you are agreeing to receive communications from us. This program was the key to my success in passing all 4 parts of the exam. The high energy lectures were clear, precise, and addressed every topic on the actual exams. I would have never passed the exam if it wasn’t for the incredible instructors. I struggled over three years to pass the exam. Surgent CPA Review was definitely a huge key to my success. I was able to pass all four sections in a row. I studied with three other review courses and can say with confidence this one is the best. The Surgent CPA Review lectures cover tons of information and give you a great idea on which areas to really focus in on. The adaptive learning question software made a huge difference in preparation. I scored an 85 on BEC my first time! 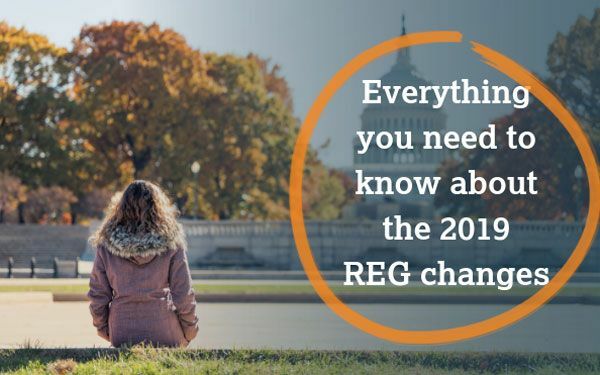 Are you ready for the 2019 REG Changes? The AICPA is implementing some pretty major changes to the Regulation (REG) portion of the CPA Exam in 2019. Are you prepared? Click to learn more about where these changes are coming from, when you can expect them, what Surgent is recommending to CPA Exam candidates, and how we’re helping our students prepare. Candidates often struggle with CPA Exam simulations, but they don’t have to! To help you better prepare for these exam questions, we’ve assembled a list of the top mistakes we see candidates make on sims, as well as strategies and tips we recommend. You’ve been studying for weeks, and now CPA exam go-time is approaching quickly. In this post, we’ll talk about how to make the most of your last two weeks of studying and crush the exam. As you study, compare how you feel on certain subjects to others. At this point, you want to take some time to reinforce concepts you really know, but most of your time should be spent working on weak areas. If you aren’t sure how to do this, consider using Surgent for your CPA exam review course; its algorithms figure out where you’re weak and targets your learning to those areas. By the time you get to the exam, you’ll have a solid foundation in every test area. If you’ve only been practicing multiple choice questions going into the exam, the SIMS are going to catch you completely off guard. Sims are a great way to get points, and you need to start practicing them earlier rather than later. Make sure you have a strategy for simulations. You need to decide how much time you can spend on each question, and you need to know how to rank sim difficulty to stock up on points. You also need to make sure you know how to use the research tool and can easily find the answer to research questions. Lastly, make sure you actually practice your sims during exam prep. Don’t just try for a little bit and then look at the answer. Real, dedicated practice will help you immensely on the actual exam. Not taking at least one practice test is one of the biggest mistakes an exam candidate can make. If you aren’t familiar with the flow of the exam and how to pace yourself, there’s a chance you’ll miss quite a few questions. Take two or more practice tests in the two weeks leading up to your exam, and make sure you simulate exam day as much as possible. Go to a quiet, distraction-free room, and take your time. Get comfortable working with the clock, opening several windows during simulations and using the Excel spreadsheet tool. This is also a great opportunity to work on timing. Each exam is timed differently and has several different sections. You need to make sure you’re spending the right amount of time on each section so you’re not rushing to finish at the end. The last two weeks of study can be the difference in passing or failing; use these exam review planning tips to maximize your study time and enter the exam room prepared. Adding to the mix of the CPA exam difficulty are the varying state requirements both for candidates to sit for the exam, and for candidates to become licensed. To help you navigate through these differences, we’ve put together the basics, as well as listed some resources to help you figure out your CPA requirements. While this sounds straight forward, deciding where you’ll practice can sometimes be difficult. If you live in a city like Cincinnati, Ohio, which closely borders Kentucky and Indiana, you need to decide which state you’ll be practicing in in order to accurately figure out what you need to do to become a CPA. Also, if you go to college or live in one state but are open to moving to another for a job, you’ll need to consider the implications of moving for your CPA requirements. Luckily, once you become a CPA in one state, it’s relatively easy to get a reciprocal license in another. However, each state has different requirements for reciprocal licenses. States require certain criteria before candidates are even eligible to take the exam. Each state is different, but most states require candidates to have completed a Bachelor’s degree, or taken 120 hours of college credit. There are exceptions: some states, such as Arizona, allow candidates to take the exam as long as they are within a range of hours of completing a Bachelor’s degree (i.e. 18 semester hours to complete before graduating). Other states, such as Ohio, require 150 hours of college credit to take the exam. In an effort to standardize required licensure hours, the AICPA has required 150 hours of education to become licensed. The only U.S. jurisdiction that doesn’t have this requirement is the U.S. Virgin Islands. The subjects of these hours vary state to state. Each state also has different experience requirements. You best resource for discovering what’s required to sit for the exam and become a CPA is your individual State Board of Accountancy. Simply type “[your state] + state board of accountancy” into your browser, and peruse the website for information on requirements. The AICPA’s This Way to CPA site also has some great information about both sitting and licensure requirements, broken out by state. The format is easy to read, and it also includes a step-by-step how-to of how to take the exam. Once you figure out your requirements, it’s time to find a great CPA review course and start passing those four parts. After that, it’s smooth sailing through the education and experience requirements for licensure. All CPA candidates have the same goal: to pass the CPA exam. And we want you to have the best chance possible of walking out of the testing area on exam day confident you did well. In this post, we’ll talk about choosing a review course to help you pass, how you should study during the review phase, and what you should do the day before the exam. Having these features will save you time as you study for the exam and have you prepared for your exam on the specified date. •	Continue to Work on Weak Areas – Now is the time to understand your weak areas and work on them. Alternatively, you can use a software that will automatically help you work on these areas. 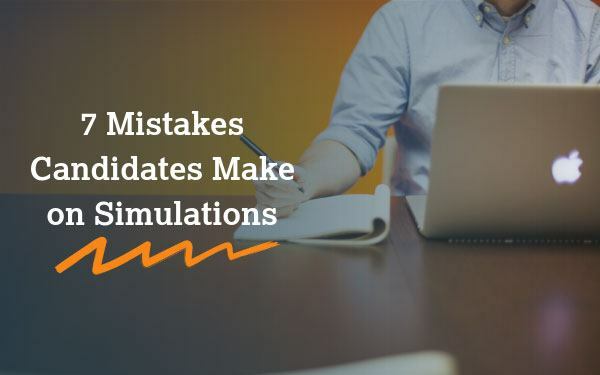 •	Get Familiar with Sims – Simulations are a great way to get points on the exam, but many candidates struggle with their format. Start doing them now so you’re ready on exam day. •	Familiarize Yourself with the Format of the Exam – Even if you’ve heavily prepared for the exam, the format can be jarring. Ideally, your review software will emulate the exam as much as possible. If not, you can go to the AICPAs website and find practice exams similar to the real exam. •	Take Practice Exams – Take some time out of several of your days to emulate the exam experience. Sit in a quiet room with no distractions and take the 3 or 4 hours to finish an entire exam. •	Keep Track of Your Scores – Or find a software that does this for you. This will give you an idea of how you’ll do on exam day. •	Don’t Study All Day – I know your college-based gut instinct is to study as hard as possible the day before exams, but take the morning to tie up some loose ends and then take the rest of the day off. •	Relax – The CPA exam is mentally and physically tough, so take the afternoon and evening to relax: go for a walk, play with your pets or watch a movie. •	Have a Healthy Dinner – Don’t have anything too heavy that will make you feel sluggish on exam day. Same goes for breakfast the morning of the exam. •	Get to Bed Early – There’s a good chance you’re going to have a hard time sleeping, so get in bed early; you can read or otherwise try to relax, but stay off your phone if you can avoid it. Becoming a CPA is expensive; not only do you have to take the CPA exam, but you have to pay for study materials and pay a licensing fee to become certified. At Surgent, we understand it isn’t always easy to pay these expenses, so we offer several course discounts to help get you started on your CPA journey. Surgent partners with several State Societies of CPAs, and if you’re a member you’ll receive a 20% discount on all enrollments. To use this discount, you need to call Surgent directly or send them an email, and you’ll need to provide proof of society membership. You can see a listing of our partnered societies on our State Societies page. Not all courses are created equal, and it’s perfectly possible for you to buy a course that doesn’t fit your needs, even if it’s from a top provider. If you’ve failed the with a different course in the past, you can purchase Surgent’s Essentials or Premier Pass for 45% off with the discount code SWITCHFULL. You’re not required to provide your failed course provider’s proof of purchase initially, although Surgent will follow up with you within three days to get a copy of documentation. If you purchased individual parts from a different provider and failed that section, Surgent will give you 30% off individually purchased section exam review material. Use the code SWITCHPART at checkout. Note that Surgent will also reach out for proof of purchase and proof of failure within three days of purchase. Surgent knows the benefits gaining the CPA certification can provide to government, active military personnel and veterans, and offers a 25% discount on complete 4-part courses or individually purchased parts. To take advantage of this offer, you can call or email Surgent directly. Surgent offers a $100 referral reward to anyone who refers friends, family, classmates or coworkers. Anyone who signs up via your referral code also receives $500 off a full 4-Part Surgent review course. You can also become a student ambassador at your college or university for Surgent. Student ambassadors receive a CPA review course for free and can win cash prizes and giveaways. There are also several websites with reviews and rankings of CPA courses that offer discount codes per course. You can find these via searching for Surgent discount codes. Surgent also offers a free trial of its course so you can familiarize yourself with the format before purchasing. You can also purchase via a 0% financing payment plan if you don’t want to pay everything up front. Your mission: to pass the CPA exam as quickly as possible. We know you want your exam experience to go smoothly, so why not use extra resources to help you pass faster? At Surgent, we offer CPA review resources outside of exam review material to help you have the best exam experience possible. Our webinars cover a variety of CPA exam topics, from time management study tips to how to navigate certain simulations. There’s even a webinar going over our review courses, so you can see if Surgent is right for you before you buy. And the truly awesome part: these webinars are free! The best feature of Surgent’s flashcard app is that it’s free. It comes with over 2200 terms and definitions, and you can use it anywhere you go. If you’re waiting in line at the DMV or bored at the dentist’s office, you can whip out your phone and do some on-the-go exam prep. Surgent’s Premier Pass includes three 30-minute sessions with a CPA exam success coach. These sessions are built to help you go over exam strategy and figure out ways to help you study best for the exam. Surgent’s Ultimate Pass includes both the 30 minute sessions, plus 4 hours of tutoring from an accounting professor. These tutoring sessions are your chance to really delve into topics you’re having difficulty with. Your accounting professor can break down these topics in a way that’s easier to understand, and more memorable for exam day. The Ultimate Pass also contains Surgent’s Excel course, which is meant to familiarize you with the spreadsheet tool. The CPA exam recently switched to using Excel in the exam; having experience with the tool will give you a huge advantage on both multiple-choice questions and simulations. Plus, Excel is used extensively in the accounting profession, and having an Excel certification will help you stand out when you’re applying for positions. Surgent’s practice exams emulate the real exam; you’ll get exposure to exam-like conditions and prior exam questions. These CPA review exams will help you develop exam strategy and figure out if you’re ready to sit. Want to see all the features Surgent’s courses offer? Head over to our course comparison page and compare our review courses to find what will work best for you. The most valuable CPA exam review course is the one that works best for you, and helps you pass the exam as quickly as possible. Surgent’s average study hours per exam part is less than half of many other leading providers. But exactly how is this accomplished? What is Surgent doing that helps candidates pass so quickly? The answer lies in Surgent’s adaptive study materials and the innovation they present in the CPA exam review arena. Let’s talk about three ways Surgent’s A.S.A.P. technology helps candidates pass the exam more efficiently. A traditional CPA review course won’t have a pre-study assessment phase. This phase is unique to adaptive learning, and seeks to figure out the information you know and the information you don’t know via a series of quizzes. The study phase uses this information to gauge where you’re strong and where you’re weak, and it develops a plan to help bolster your weak areas and retain your strong areas. This phase decreases your study time because it identifies what you actually need to learn, instead of just making you cover every topic with equal weight. If you’re an expert on leases, you’ll probably spend more time on other topics in an adaptive learning program. After you go through the assessment phase, a customized study planner is built around your learning needs. It also takes into account your availability and your exam date to make studying every day as efficient as possible. This hyper-personalized plan allows for fewer, more focused study sessions that work on your individual weaknesses. It also takes the onus of you for developing a study plan for yourself, saving you time before you even start studying. 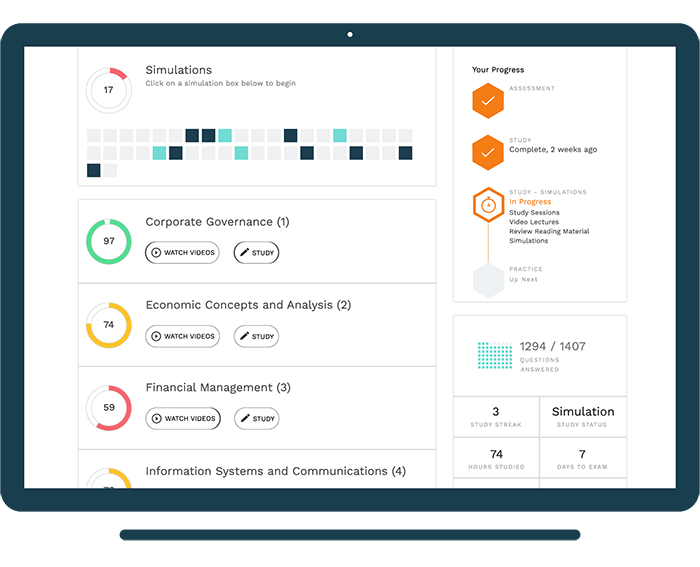 Adaptability is a key feature to any adaptive learning technology, and Surgent uses real-time algorithms to judge a student’s progress in order develop a constantly updated path to CPA exam success. The software adapts as students learn and adjusts to make sure students are practicing weak areas and maintaining strong areas. This adaptability optimizes study time; you’re learning what you need to learn when you need to learn it. Surgent’s adaptive study materials are aimed specifically at the individual; this personalized approach helps candidates spent the optimal amount of time studying and has them ready for the CPA exam on the day they plan to take it. CPA exam pass rates are presented to give us an idea of the difficulty of the CPA exam. But reading too much into them won’t help you pass. We all want to know our chances of passing, but obsessing over scores isn’t healthy for your exam prep. Let’s talk about two common CPA exam pass rate traps and how you can reframe them in a positive way. The CPA Exam is meant to be hard; it ensures that those in the profession are experts. The pass rates reflect this difficulty with percentages hovering around 50% for each exam. Many of us look at this number and it starts to haunt us. Instead of considering that 50% of people do pass each individual exam, we think about the fact that 50% of people don’t. We focus on the glass half empty, which can lead to a vicious spiral of negative thoughts and emotions. And if there’s one thing there really isn’t room for during your CPA review, it’s negative thoughts. Sometimes lazy study days turn into pass rate obsession days, where we berate ourselves for not studying more but can’t seem to tear ourselves away from pass rate thoughts. By obsessing over them, we miss out on valuable study time and become more distressed about what those pass rates can mean. We start to focus on an unknowable future instead of focusing on what we can do right now to improve our chances. If you’ve found yourself in either of the above positions, letting pass rates get you down or obsessing over them on bad study days, you’re not the only one. CPA exam prep is test of mental strength; it’s unlike anything you’ve done in college while concurrently being your key to upward mobility in your career. Of course it’s mentally taxing! But there are ways to remedy these negative emotions. Firstly, try to reframe what those pass rates mean. Broken down simply, half of the candidates pass and half of them don’t, and there’s as good a chance you’ll be in the passing half as the non-passing half. Secondly, worrying about the future does nothing, but sitting down and focusing on the present will set you up for passing down the road. Take a deep breath and try to get rid of the negative emotions that come up when you think about pass rates. Then consider all the positives that will come with passing, and get back to studying. The CPA exam is not easy, but the more you do to position yourself for passing, the more likely it is you’ll pass quickly and (relatively) painlessly. One of the easiest ways to help your study journey is by participating in activities outside of studying to keep you sharp during your CPA exam review. Keeping yourself both physically well and mentally alert will help with study longevity and make you more prepared for the exam. We’ll talk about four ways you can ensure you’re taking care of yourself in order to stay sharp for the exam. Gone are the days where you pulled all-nighters in order to study for an exam. CPA study prep is a marathon, not a sprint, and you need to make sure you’re well rested every day for your several months of study. Marathon studying is draining, so try to aim for 8 full hours of sleep every night, and put the phone down at least 15 minutes before bedtime. If you’re having a hard time falling asleep at night, check out our second tip. Believe it or not, exercise positively impacts mental and emotional health. Movement’s reduction on stress has been well documented over the years, and incorporating an exercise routine into your exam prep will help you study longer, sleep better at night, and be more physically prepared for the mental taxing of the CPA exam. You don’t have to do anything crazy, but try to get out and walk for 30 minutes a day or hit the gym and do a workout class. Anything to get you on your feet and moving. I know you’ve told everyone you’ll be unavailable for the next few months studying, but getting out and decompressing with people will actually help you stay sharp during your CPA study prep. Socializing helps you relax and live more in the moment, taking you away from the daily distraction of the CPA exam. Mark a day every week or every few weeks where you try to get out and socialize. For most of us, the CPA exam is a burden, it’s a negative process. When these thoughts start to roll around in your head, try to reframe them. Think about the positive aspects that will come out of taking the exam. By shifting your focus and framing the exam in a positive way, you’re more likely to enjoy your study time and feel prepared going into the exam. By taking just a few simple steps (at least in comparison to studying) you can put yourself in a better position to pass the CPA exam the first time around. Choosing the right study material is almost as hard as taking the actual CPA exam. Between scouring reviews, rankings and pass rates, it can be difficult to decide which course will work best for you. In this post, we’ll talk about 4 ways to compare review courses, along with relevant questions you should ask of each. There have been quite a few advances in learning technology, with adaptive learning technology taking over the exam prep sector. Adaptive learning technology has been proven to improve retention while also improving study time, a win-win for exam candidates. Compare review courses by looking at the type of technology they offer. •	Does it cater to an individual learning styles? •	What pass rates does it produce? It’s really important for a review course to offer a practice exam (or several) very similar to the actual exam. This will help you get a feel for the real exam format and develop time management skills so there are no surprises on exam day. •	Do the materials come with full-length practice exams? •	Are the exams similar to the CPA exam format? •	Do the practice exams contain questions released by the AICPA? Many high-ranking companies only offer the study materials. Look for courses that offer more than that. After all, the CPA exam is very difficult; you’ll want to utilize all of the resources available, such as flashcards, coaching and webinars, to ensure your exam experience goes as smoothly as possible. •	Do the study materials have flashcards? •	Are there opportunities for tutoring? •	Are there other free resources the company offers to help you pass the exam? Accounting standards change often, and the CPA exam updates to reflect those changes. If you’re working with materials that aren’t updated, you may be studying the wrong information for your exam. Look for courses updated based on the current exam to ensure you’re getting the most accurate study materials possible. •	How often are the materials updated? •	Are they updated according to exam updates? Remember, your course is a big investment and it might be the difference between passing and failing. Make sure you’re comfortable with a specific study material before you jump in and buy. The best exam prep course is the one that works for you, and not all CPA review courses are created equal. By taking time to discover how you learn, you can compare courses and decide which one works for you. In this post, we’ll discuss just how to do that: by helping you discover your study type and your ideal learning time. There are four main learning types; Below, we’ve listed each with a brief overview and how you can tell if it’s your type of learning. 1. Visual - These learners prefer using pictures and visualizing relationships between ideas. They retain information by looking at charts, graphs, and other information relating ideas. 2. Auditory - These learners prefer to hear information, and often learn by listening to lectures or stories. 3. Verbal - These learners like to talk, enjoy working in social groups, and learn by explaining ideas. 4. Reading/Writing - These learners retain information by reading a textbook or writing out notes. Some people are great at staying up all night and studying. Some people can’t sit for 10 minutes without needing a study break. Think about your past study styles. If you’re in a focused mood or have a deadline, can you sit for long hours getting work done? Or does the thought of a marathon study session scare you? Generally, people aren’t on the far ends of the spectrum but somewhere in the middle, needing various amounts of bite-sized study time. 1. Does it have features suited to my study type? Consider materials ideal to your learning style (i.e. charts and graphs for visual learners) and make sure they’re present in the materials. 2. Does it have features suited to my learning time? Are lectures and readings long or bite-sized? Are quizzes presented frequently? By asking these questions and using them to compare review courses, you can decide what’s right for you based on your individual learning. Remember to also look at online reviews to see if anything jumps out at you about learning style, and make your decision based on what you think is best for you. *National Pass Rate calculated by averaging the pass rates of each CPA exam section as reported by the AICPA for Q1 2018: 49.27% (AUD), 56.43% (BEC), 41.59% (FAR), and 49.99% (REG). Surgent pass rates calculated through a survey of students and are accurate through May 2018. For more information on how Surgent pass rate is calculated, click here. Hours saved based on actual observed study time of all Surgent CPA Review students, from the time they start the assessment to the time they reach a ReadySCORE of 75. For other CPA Review providers, average study time was estimated based on the following factors: student watches all videos one time, student reads all textbooks one time (estimate 10 pages/hour), student views each multiple-choice question (MCQ) an average of 2 times (estimate 1.5 minutes/question), and student completes each task-based simulation one time (estimate 20 minutes/question). Surgent CPA Review's Premier Pass named a Top New Professional Education Product of 2018 by Accounting Today. Click here to read more. **Results based on students who achieve a 75% ReadySCORE or above across all content areas, topics, and question types.